A big discovery in concussion research reveals just how much there still is to learn. One year ago today, we attended the National Neurotrauma Society Symposium and had the opportunity to speak with several PhD students presenting ground-breaking research in the field of concussions. There was one research study in particular from a group of Boston University researchers that stood out, which suggested that Chronic Traumatic Encephalopathy, or CTE, is not caused by concussion, but rather impacts to the head. This revelation is important because it can help better inform prevention efforts to focus on mitigating head acceleration. The construct of this study, however, is focused only on direct head impacts and doesn't include the large portion of concussions that result from whiplash, either from a blow to the body or fall to the ground. Building off this study, we share research from a comprehensive NFL Concussion Video Analysis, a TED Talk on rotational forces in the brain and more to paint a clearer picture of how core and neck strength are critical in dissipating the injurious forces on the brain in sport. In this study, mice are pinned down so that their head can still move freely. Groups of mice were either exposed to a blast wave or a direct impact to the head from what is essentially a very expensive, very precise pinball launcher. Then...POP! 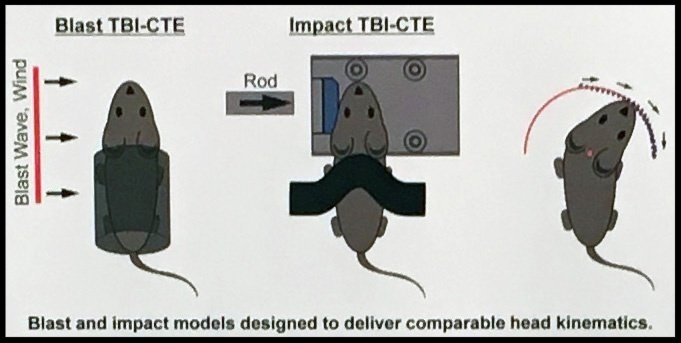 What the research revealed was that mice from both groups had an increased presence of tau in the brain, the pathology for CTE diagnoses. 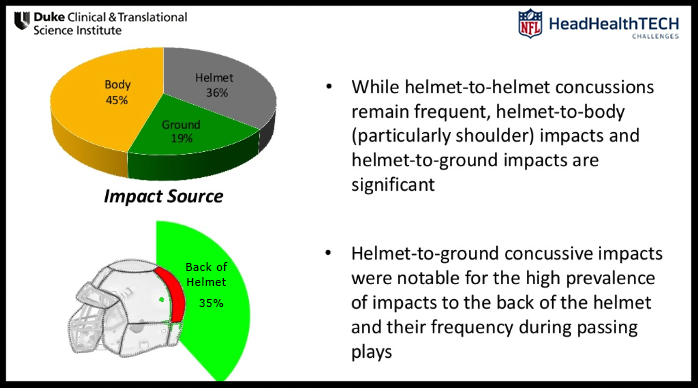 One of the key findings that stands out is the high percentage (35%) of helmet-to-ground concussive impacts to the back of the helmet. We were also fortunate enough to hear from Stanford professor and researcher David Camarillo, who spoke about the impact rotational forces have inside the brain, twisting and shearing the axonal fibers. The color overlay in the gif below illustrates the level of shear forces throughout the brain (red is most severe) from a high level impact. The most poignant revelation from Camarillo’s research is how the areas of the brain that are exposed to the highest levels of rotational forces are severely damaged in the brains of football players who had CTE. David Camarillo has an excellent TED Talk on Why Helmets Don’t Prevent Concussions and What Might that is worth watching. ...he may just ask for a stronger neck. Especially after reading this article! 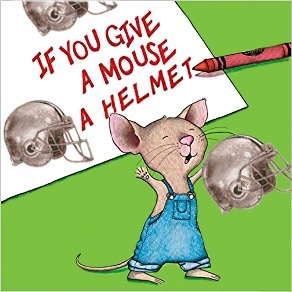 Few sports utilize helmets. Prevention efforts focused on minimizing head acceleration can reduce risk of concussion or head injury for athletes not just in football but across all sports, like rugby, soccer and basketball. Thanks to the advances in research over the past five years, the neck is no longer an afterthought. Implementing an efficient and measurable neck training program for athletes will better serve coaches and parents looking to invest in better protecting their kid's brains on the playing field. Knowledge fuels change. Please share with a friend!